8/24/2016Share this story on Facebook! Meghan Musnicki ’05 took home her second gold medal at the summer Olympics in Rio this August. 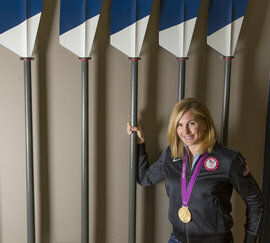 She was part of the U.S. rowing team’s women’s eight. Emily Morley ’16 competed for the Bahamas in the single sculls event.